bjimba's bjimblog: A hollow Texas drawl says "Plugh"
I predict that every tech blog written by someone over the age of 30 will have a link to defective yeti: Xyzzy within the next few days. Depending on how much older than 30, you may see references to Zork, Adventure or Colossal Cave as this wonderful political satire is discussed. Speaking of which, the image for this post is a promotional brochure from 1981, for one of Microsoft's first products for the IBM-PC. 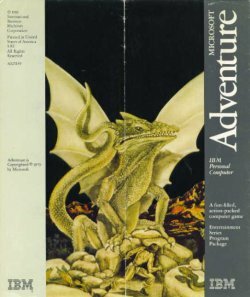 Nowhere in the brochure does it mention that they copied this program almost verbatim from the original minicomputer game Colossal Cave.